"This recipe came from a very old Italian family and it is super!" Beat eggs and milk together in large bowl. Beat in flour until batter is smooth. Lightly coat an 8 inch skillet or crepe pan on medium-high heat with cooking spray. Make one pancake at a time by dropping a large spoonful of batter onto pan and tilting to cover the whole surface of the pan evenly. Cook until golden, turning once, about 2 minutes per pancake. Fantastic!!!! This recipe is almost fool proof. I stuffed the pancakes with ground beef, garlic, spinich and cheese then covered with a mix of tomato sauce and cheese sauce. This is the only way to go and so much easier than trying to stuff a manicotti shell. Thanks Carol! Very good recipe. Tastes like pasta but in a good way. This recipe made very light "pancakes" for manicotti which were easy to prepare and delicious. My mother has been using this recipe for years. Its the only way we make Manicotti..if people buy those store bought ones in the box..they aren't eating real manicotti. This recipe is awesome. The pancake is light and delicious. 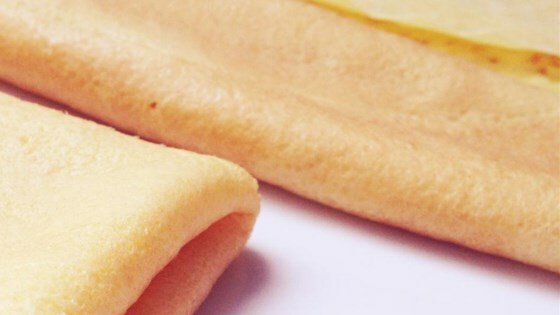 Perfect crepe for your homemade manicotti. Thank you for sharing. These weren't half bad. I love how they are so healthy for you.